Among the many powerful words that Dr. Martin Luther King, Jr. uttered in his lifetime, there could be no greater message that outlined his speeches than the power and importance of love. Community-building is a notion that came from the very concept of caring for one another, with love being the the glue that holds all the building blocks together. But as we look around our great community today, we see more and more black people tearing each other down or stabbing each other in the back in the name of greed and power. There is less lifting as we climb and more stomping as we step, division bubbling like a naughty cauldron within a race that once banded together to fight for civil rights. What has become of the black man today? What has become of black women? Why is sisterly hate such a present thing in our contemporary space? Why don’t we help each other more? Are we not socially responsible for our communities? Should we not remember where we came from? Even Dr. King noticed the insanity of man and the problem he faces in the modern world. In his 1954 speech, “Rediscovering Lost Values”, King revealed that the problem with us today is that we have forgotten the values of the past. The intrinsic values of love, hope, caring, mercy. We have closed our eyes to what was once segregation and blatant racism, cried out Hallelujah for what some believe to be “post-racialism” and turned our backs on those who need us most. We have shaken our shoulders of the burdens of our own plague-ridden communities and moved on up to the East Side, allowing the brain drain to become something more present and real in our society. This is what kills us as a people. This pushes us into the downward social spiral that we have unfortunately created. “I think we have to look much deeper than that if we are to find the real cause of man’s problems and the real cause of the world’s ills today. If we are to really find it I think we will have to look in the hearts and souls of men. (Lord help him). How do we rise out of this state? How can we change this vile space we are in? We need to look back to the past to rediscover those values that will bring us forward together as a race, united and banded for peace and prosperity. 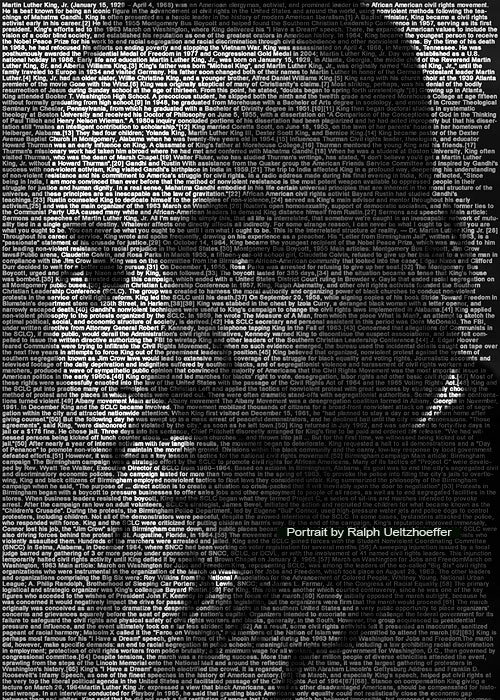 Look back, to the words of Dr. King, to discover the justice we can so righteously bring into the 21st century. Those precious values that we have left behind. Those precious values. Mmmm. Where are they? Are they really unretriavalbe? In that generational gap between “Yes M’am” and “Shawty”? Where did it go. Is it really something saved and stashed away on a 3 ½ floppy disk, unable to be stuffed into the USB port on your laptop? Perhaps, these values that are so important to us aren’t really that far behind. Swept under the rug maybe if we want it gone. But they live within each of us and we can all make a difference. As you reflect on the works of Dr. King, take these words to heart. The past has taught us crucial lessons as a people. It has taught us how to be undeniably proud of our race and staunchly proud of our rights. But more important, in that dear reflection of yesteryear exists the code that answers today’s most cryptic question: how do we move forward as a people? By simply, looking back. But know, that objects in the mirror may be larger than they appear. Thus, the answer is quite clear. We must learn to love more.